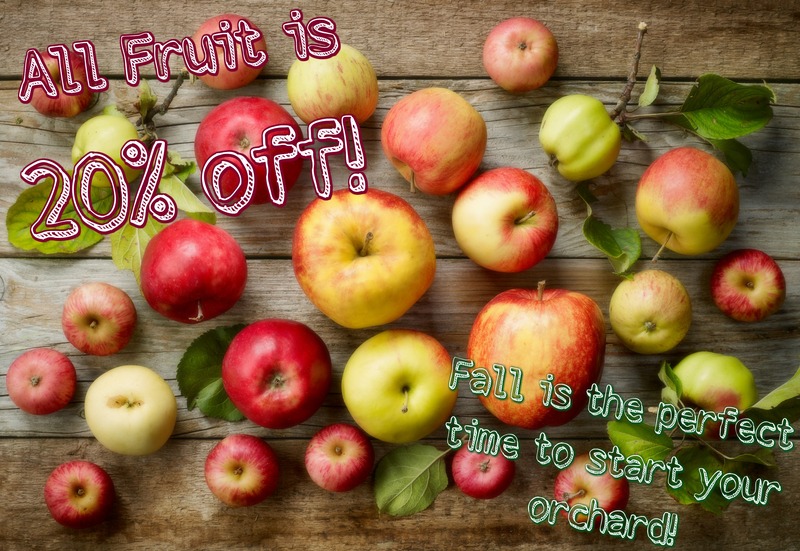 Fall in love with Fruit - GreenScapes Garden Center & Landscape Co. Nothing compares to the taste of fresh fruit or the experience of picking fruit from your own back yard. With a wide range of fruits and ripening seasons available, your family can enjoy the harvest summer through fall. Dwarf fruit trees are suitable for small spaces and the fruits are easily harvested. While self-fertile varieties will fruit sufficiently for the home gardener, other varieties may require cross pollination. In addition to the beauty dwarf fruit trees lend to your landscape, most varieties produce fruit 2 to 3 years after planting. Spring flowers produce attractive, flavorful fruits to be enjoyed for fresh fruit, canning, freezing, homemade preserves, and pies. 1. A primary objective of training and pruning is to develop a strong tree framework that will support fruit production. Improperly trained fruit trees generally have very upright branch angles, which result in limb breakage under a heavy fruit load. This significantly reduces the productivity of the tree and may greatly reduce tree life. Another goal of annual training and pruning is to remove dead, diseased, or broken limbs. Proper tree training also opens up the tree canopy to maximize light penetration. For most deciduous tree fruit, flower buds for the current season's crop are formed the previous summer. Light penetration is essential for flower bud development and optimal fruit set, flavor, and quality. Although a mature tree may be growing in full sun, a very dense canopy may not allow enough light to reach 12 to 18 inches inside the canopy. Opening the tree canopy also permits adequate air movement. Additionally, a well-shaped fruit tree is aesthetically pleasing, whether in a landscaped yard or a garden. 2. When purchasing fruit trees, be sure to obtain information regarding cross pollination and recommended pollinators for your selections. 3. Possible protection may be required for fruit trees as rabbits and deer may eat bark at snow line and new buds from low branches during winter months. Tree wraps work extremely well and are available in a variety of forms. Small fruits allow you to choose from a wide variety of flavor, growing habits and fruiting times. As well as being ornamentally attractive, these plants require minimal growing space. Spring flowers produce plump, delicious, colorful fruits; each variety displaying its own characteristics. Most varieties will fruit sufficiently for the home gardener; other varieties may require cross pollination. A diverse selection of small fruits in the garden will provide a bounty of fresh fruit for your family, season after season. Use these delectable treats in an endless list of desserts, pastries, jams and jellies, juices and wines. 1. Site selection is an important first step in growing small fruits. Grow in full sun for optimum growth and fruit protection. 2. Small fruit crops prefer a soil pH range of 5.5 to 7.5. The one exception is blueberries that require acidic soils in the pH range 4.8 to 5.2. Soil tests will indicate pH values and help determine any amendments (limestone or sulfur) needed to change soil pH. Soils should also be worked up and organic material, such as compost, added to help improve soil conditions prior to planting. The first step in planning a planting is assessing the plant site and fitting the appropriate plant species to that site. Things to keep in mind for site selection: Soil conditions, sun and wind exposure, what size plant will the site allow, space constraints such as pavement, walkways, buildings, and other trees. Things to keep in mind for plant selection: Tolerant to the moisture and drainage of your soil, tolerance to sun and wind exposure of your site, what mature size is appropriate for the site? The Mohawk Valley has a predominately clay soil. This is one of the least desirable soils to grow your plants in. The best thing you can do for your plants would be to have them in a raised bed which will keep the plants main root system above the clay soil, which retains too much moisture, contains no air spaces, and becomes hard packed when dry. New landscape beds should be fully prepared prior to planting. This is the time to add extra topsoil, composted manures, etc., with the existing soil. If you are preparing a raised bed it is recommended to till the existing ground area prior to building the site up. If your soil is composed of clay you should add some form of compost at a 1-1 ratio. For sandy soils (usually found north of the Mohawk Valley) mix topsoil and compost at a 1-1 ratio. The planting hole should be at least 2 times the width of the container. The depth of the hole has to be no deeper than the container. 1.) Find the trunk flare of the plant before you start excavating a hole. The trunk flare is the area on a plant where the roots start on the trunk. Sometimes you will have to remove some soil to expose the trunk flare, do this after you have the plant in the hole. Excavate a hole using the rule above for measurements. Slope the sides of the hole, increasing the friable soil for vigorous root growth. Remember when planting in clay soil to have the plant raised above the existing soil level by 4-6 inches. 2.) Remove the container gently, prior to planting. Sometimes container-grown plants become rootbound. This means that the roots have become overgrown with in the container. If you notice an overabundance of roots, make some vertical slits down the sides of the rootball and spread the outer roots gently. 3.) Backfill the hole with the amended soil. Do not stamp the soil down too hard. Packing the soil down too hard may make drainage and aeration difficult. A raised ring of soil formed around the edge of the rootball will create a basin that can be filled with water. Watering is the most important thing you have to do to maintain a properly planted tree or shrub. All new plantings, depending on the weather conditions, will probably need to be watered at least once a week for the next 2-4 weeks. After the initial 2-4 weeks, all plantings should be checked frequently for adequate moisture levels for at least a year (especially during the hot and dry summer and fall months). The easiest and best way to tell if your plant needs water is to make a hole in the soil about two inches deep beneath the plant and feel if there is moisture or not. If the soil feels dry, it is recommended to set a hose at a trickle at the base of the plant until the area is thoroughly wet. Watering time will vary depending on the size of the rootball. You want to water so that the entire rootball is wet. A quick sprinkle from a hose does not provide enough water to seep into the deeper roots. This entry was posted in GreenScapes News. Bookmark the permalink.